Why Can't We Sing Along? Write Letters to Mr. Deputy Assistant Secretary! It's an exciting time to be in Beth Nahrain right now. The twelve days of festivities marking Kha B'Neesan (Assyrian New Year) have taken on a special significance this year with the probable imminent change of regime in Iraq. The Assyrian Democratic Movement (ADM) has been working tirelessly 24 hours a day, 7 days a week to make sure that Assyrians have a voice in any future Iraqi government. "You must see it to believe it!" insisted Youash Tower, the secretary of the Assyrian Aid Society in Australia. "The ADM is our Assyrian government operating on our own land." Whilst the thought of seeing Assyrians administer our own land was appealing, the thought of seeing the Tigris river and touching the fertile soil of Beth Nahrain was even more so, especially to Assyrians born and raised in the diaspora. Nicholas Aljeloo also agreed that this year we would ring in Kha B'Neesan together and in our homeland. After a couple of connecting flights we arrived in Damascus where we were greeted and taken care of by a representative of the ADM. In fact, every step of the way the ADM made sure we were safe and looked after. After a day there we caught another flight to Qamishli, a city in North-Eastern Syria. From Qamishli a group of about twenty of us from the diaspora were driven to the Syrian-North Iraqi border where we first saw the beautiful Tigris river. Motor-powered boats were awaiting us and we were taken aboard, along with our luggage and we crossed the border. The muddy March weather didn't detract from the beauty of the journey. After we both baptised each other by the banks of the Tigris (after which David officially changed his name to Tiglath) we walked to the checkpoint where we were greeted by an Assyrian delegation, along with an armed Assyrian guard. Despite a large sign saying Welcome to Kurdistan we knew we were on Assyrian territory after being greeted by the welcoming committee - with names like Gilgamesh, Nishra, Esarhaddon and Durara, we obviously had landed home. After traditionally kissing the first member of the welcoming committee on the cheek we quickly learned that in Northern Iraq it was four kisses for a greeting. We then got into prepared vehicles and were whisked to Nohadra (Dohuk). Nohadra is the centre of the Assyrian government in Northern Iraq. It is here that the main democratically elected Assyrian party, the ADM, has its headquarters. Upon entering their headquarters we were greeted by an armed Assyrian guard who welcomed us with Shlama alokhon. To his right draped across the front of the building was Zowaa's huge flag. We were in good company. The delegation of Assyrians who were trickling back to our homeland to celebrate the Kha B'Neesan this year had grown. Assyrians from America, Europe, Australia and - for the first time (officially anyway) Iran - mixed with 6 Assyrian singers like Linda George, Laith Batros, John Dashto and Ramsen Sheno. We were quickly shown around their headquarters and walked into a workshop where we saw the preparations for the Kha B'Neesan festival. Assyrian police guards were busying themselves whilst on guard duty preparing flags, banners and hats that would be used during the Kha B'Neesan parade. "We make do with what we have", explained one of the workers. The days to come would be busy days indeed. The Kha B'Neesan parade in Dohuk, the tour of Nissibin, Arbello and Urhai Assyrian schools as well as the concerts in which 6 Assyrian singers would perform and the other AAS initiated projects all promised us an opportunity of a lifetime. In ancient Assyria the Akitu festival was celebrated by a parade down ancient Babylon's procession way and through the famous blue glazed Ishtar gate. Little has changed over the past 2700 years. The same descendants of the ancient Assyrians this year followed the traditions of their ancestors and held a mezalta (festival) in the North Iraqi city of Nohadra on April 1st. Distant drum beats sent forth an invitation to the city's populace and prepared them for the mezalta that was to shortly follow. A crowd steadily grew outside St. Mary's church in Nohadra. As the crowd waited thousands of Assyrian flags, all painstakingly prepared by the ADM's tireless workers, were handed out and purple banners with Syriac, English and Arabic writing were unfurled while the marchers moved into position. "It's an ancient festival and as descendants of the ancient Assyrians we are just fulfilling our oligations to our ancient ancestors," an obviously emotional Linda George said. At midday the signal was given and the mezalta officially began. It was led by two Assyrian boys holding a Syriac banner. 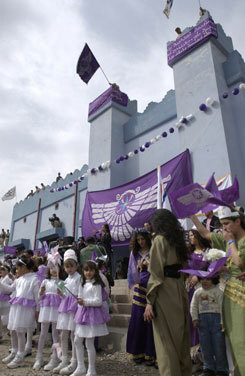 On their heels were a group of Assyrian children dressed as angels holding twirling Assyrian flags. Following closely on their heels was a contingent of Assyrian females draped in red, white and blue dresses adorned by the Assyrian flag. Next in line was a group of Assyrians dressed in their traditional tribal costumes. 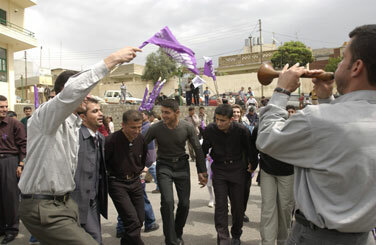 In their midst was a pair of Assyrians playing the zurna dawula. The group reacted to the sound of the beat and they danced the traditional Assyrian dances as the parade moved on. Next in line was a row of men dressed in Assyrian costume. The vibrant colours of their traditional Assyrian mountain costumes was highlighted by the the spring sunshine. Laith Yousif, an Assyrian singer from Chicago Illinois remarked, "I am very happy to see so many of our people in our own land. I hope that next year we can hold a similar parade in Baghdad." Following next was a row of dignitaries, led by Yonadam Kanna, Secretary General of the ADM, who stood side by side with Kamiran Kherebeck, prince of the Yezidies. The flags of the mezalta organisers, the ADM, were being waved by most of the crowd. Even though advertising had been kept to a minimum the Assyrians of Nohadra instinctively knew about the mezalta and kept the time honoured traditions of their ancestors. As the mezalta proceeded through the streets Assyrians from near and far joined behind the dignitaries and clogged the streets of Nohadra. The non-Assyrian population of Nohadra also stopped, turned and looked at the endless procession as it streamed past their shops and homes. Many had never seen such a procession. Many non-Assyrians were also seen either joining the parade or clapping from the sidelines. By the time the mezalta neared its end the parade's length had grown to an estimated 2.5km in length, with over 25,000 marchers and countless other spectators as it slowly snaked its way around Nohadra. The ADM's official figure is 20,000, a conservative figure well below most observer's estimates. A non-ADM estimate is at the high end - 70,000. Why so many? Well, explained the on-looker, if you take into account all the by-standers, many of who were in a way involved in the procession, you will easily reach that figure! The parade ended at the Assyrian Cultural Centre in Nohadra and the crowd quickly streamed into the open area in front of the building to await the concert that was to follow. The concert had been organised by Yousip Bet Rasho from Chicago, Illinois, publisher of the releatively new Assyrian Times and the long-standing Assyrian radio and television shows. He had been responsible for bringing the six singers together (who by the way donated their services to the Assyrians of Northern Iraq free of charge), and had paid for the majority of the travel and accommodation expenses. After a short introduction the singers took to the stage. Marlene Khoshaba, Ramsin Sheno, Laith Yousif, John Dashto, and the new star from Syria Shamiram Somi all sang to the roar of the appreciative crowd. The concert reached a crescendo when Linda George took to the stage and sang her famous song, Atara Litly (I have no Country). The song's opening words sung were poignant indeed, and some Assyrians in the crowd had tears streaming down their cheeks. Ana shima itly. ( I have a name). Ena atra litly. (But I have no country). As she sang young Assyrian girls linked their arms together and danced in front of the main stage. Ramsin Sheno had no words to describe the event. "I am speechless!" he cried. "From A to Z everything was awesome." Rabi Ishmael, of the ADM, said that there are those who belittle the celebrations saying it's only singing and dancing. It's a lot more than that, he stressed. Every one of those who had joined the celebrations in their homeland did so of their own will, they walked for kilometres through the streets with little if any prior advertising - this has a great symbolic effect on raising the nationalistic spirits of Assyrians here and around the world and on showing those with who the Assyrians are living with in Bet Nathrain that the Assyrians exist and are strong. Indeed the parade and concert had been a stunning success. All who had taken part realised that they had been a part of history. On the eve of what could be another war in Iraq, the mezalta and concert served to raise the Assyrians' morale and let them know that their brethren in the galoota had their eyes on them in the months to come. (ZNDA: Baghdad) According to the Catholic World News the Christian leaders in Iraq have been protesting a government ruling that would place all churches under the supervision of the government's Ministry of Islamic Property. The same report indicates that the leaders of Iraq's Chaldean Catholic Church, Church of the East, and the Armenian churches have complained that this new ruling would threaten their traditional independence from state control. 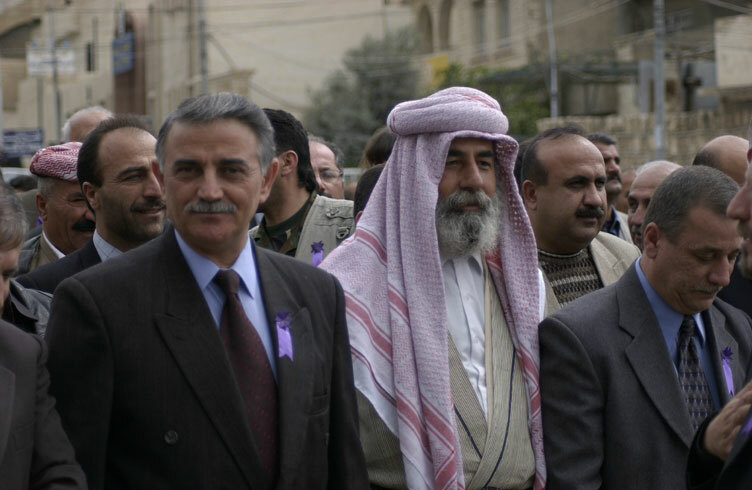 Critics of Saddam Hussein also argue that the ruling is designed to weaken the country's ethnic minority groups, including Chaldeans and Assyrians as well as Kurds. The Chaldean Catholic Church, centered in Baghdad, has enjoyed substantial religious freedom under Saddam Hussein, and Patriarch Raphael I Bidawid, the head of the Eastern-rite Church, has been an outspoken critic of Western sanctions on Iraq. But there have also been persistent signs of tensions between Church and state-- for instance, when the government forced the Chaldean Church to print quotations from Saddam Hussein alongside Gospel passages in the liturgical calendars printed for the year 2002. In the early 1980's millions of dollars were spent by the government of Iraq to finance the construction of several Chaldean Catholic Churches in America, angering many Assyrian activists who felt that this action may put the largest Assyrian church (over 800,000 in Iraq) under strict government rule. Iraq does have a Minister of Religious Affairs in the government (Adbul-Mun'im Ahmed Salih) who is responsible for all religious dealings in the country. The Ministry of Awqaf and Religious Affairs supervises the various Islamic and other religious schools, state owned religious properties, and dealings with the various churches present in Iraq. According to Reynolds Kiefer at the U.S. State Department's Iraq Desk the report from CWN may be only a speculation since the Ministry of Awqaf (Arabic for Law) and the Religious Affairs supervises all religious matters in Iraq, including those of the Christian churches in Iraq. (ZNDA: Tehran) President Mohammad Khatami said on Sunday that in a community where the republic system of government has been accepted, all democratic means should be honoured. In a meeting with members of parliament representing religious minorities, including the Assyrians, he said that the government has upheld the law in line with the republic system and its democratic nature. The president lauded the age-old history of coexistence between Iranian religious minorities and their fellow Muslim citizens and said that the religious minorities have always stood against the enemies of Iran. Representatives of the religious minorities expressed deep concern about Israel's massive military attacks against civilian targets in Palestine which has caused heavy loss of life among the Palestinians. Mr. Yonathan Bet-Kolia was present as the representative of the Assyrians in Iran. He is also the Secretary for Asia in the Assyrian Universal Alliance. The representatives of the Majlis for Iran's minority group voiced support of the Iranian Jews, Assyrians, and Armenians for the Palestinians against Israeli occupation and called on the international community to put an immediate end to the Israeli attacks in Palestine. (ZNDA: Baghdad) On 25 March a delegation of the Russian Orthodox Church headed by Metropolitan of Smolensk and Kaliningrad Kirill, the chairman of the foreign relations directorate of the Moscow Patriarchate, began a visit to Iraq. Archimandrite Yelisey, the representative of Patriarch [Aleksiy II] of Moscow and All Russia to the Patriarch of Antioch and all the East, whose residence is in Damascus accompanied Metropolitan Kirill during the visit which lasted until 31 March. This was the first visit of a Russian Orthodox Church delegation to Iraq in the whole history of Russo-Iraqi and Soviet-Iraqi relations. Metropolitan Kirill passed to Iraqi President Saddam Hussain a message from Patriarch Aleksiy II and met with Minister of Religious Endowments (Awqaf) and Religious Affairs [Dr. Abd-al-Mun'im Ahmad Salih] and led a service in one of Baghdad's Orthodox churches. He then met with the heads of the Assyrian (Chaldean Catholic and Church of the East) and Armenian Churches in Baghdad. 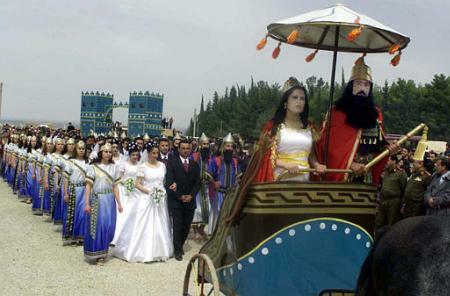 (ZNDA: Hasakah) With a historical pageant evoking the glory of the ancient Assyrian empire, more than 25,000 members of Syria's Assyrian community celebrated the arrival of spring and the month of Neesan. They also celebrated with the wedding of 16 couples performed on a stage in an arena in this northern city, 550 kilometers (345 miles) northeast of Damascus. The brides and grooms entered the arena behind a two-wheeled chariot bearing a canopy decorated with a sun, an Assyrian imperial symbol. 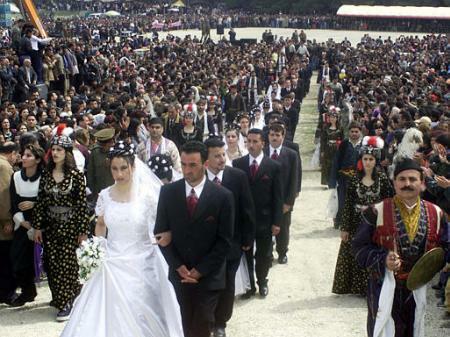 The couples were escorted by men dressed in the uniforms of the royal guards of the Assyrian empire which, at its zenith between the 9th and 7th centuries B.C., stretched from the Gulf through modern-day Iraq, Syria and Turkey to the Mediterranean Sea. 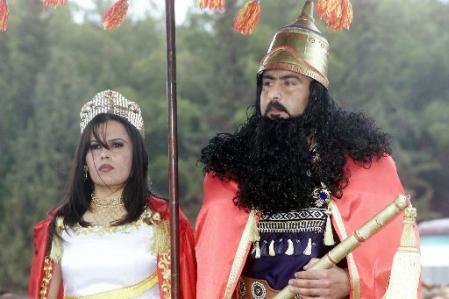 "By acting as king, I revived history," said Osama Yakhanis, 31, who drove the chariot in royal costume along with his "queen," Nanar Younan, 27, who was dressed as the mythical Assyrian queen Semiramis in a red dress with yellow and white embroidery. The sense of history was not lost on the bridal couples. "I participated in this mass wedding for the greatness of the day for Assyrians," said groom Senharib Gabro, 33, a member of the Syrian Orthodox Church. His bride, Shamiram Eskander, 26, said: "I loved this wedding because it was not traditional." "I feel very happy today," she added. 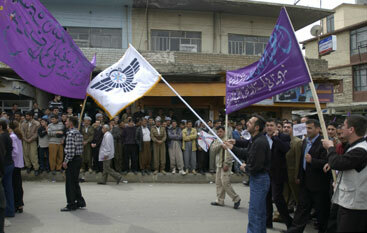 The Assyrian population of Syria is estimated at more than 150,000 people, of whom about 90,000 live in al-Hasakah. While they enjoy freedom of worship, some Assyrians seek minority status in order to promote their language, Syriac, which is currently only taught in Assyrian churches. "We call on the government to recognize Assyrians as a national minority, not only a religious one," said Aziz Aheh, an executive of the Assyrian Democratic Organization. The head of Assyrian Women's Union in Sweden, Elisabet Nison, had come to al-Hasakah to attend Monday's celebration. 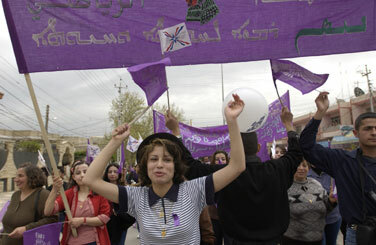 "Nissan is a message for all the world that we, Assyrians, still exist," Nison said. (ZNDA: Los Angeles) Assyrians of Southern California came together on 22 March to celebrate the arrival of spring and the Assyrian new year 6752 at the Deukmejian Hall in Mission Hills, California. Walter Aziz and his band entertained the more than 500 attendees at what may have been one of the most successful Assyrian New Year parties of this association. Historically the New Year's Eve parties have exerted a greater pull on the guests of the Assyrian organizations and churches. With the news of the successful Assyrian New Year parties from San Jose, Modesto, Chicago, Houston and Los Angeles it appears that more Assyrians, youth in particular, are attracted to the Assyrian New Year's parties in North America. 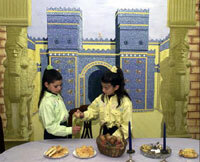 Assyrians in Sydney, Sweden, Russia, Armenia and Germany also observed the arrival of spring and the Assyrian year 6752 in public parks and dance ballrooms. The Los Angeles City Council Member, Nick Pacheco (14th district), was the guest of honor at the New Year's Party in Los Angeles. After briefly speaking to his Assyrian hosts, Mr. Pacheco was shortly after interviewed for the local Assyrian T.V. show. (ZNDA: Bethlehem) Just how Yusef Balawi came to sustain a bullet wound through the chest while inside the city's Syrian Orthodox Church last Friday morning is hopelessly tangled, but in one respect he was fortunate. After checking his identity papers for more than two hours, Israeli troops allowed an ambulance to take him to hospital. Mr Balawi is a member of Yasser Arafat's preventive security services, the branch of the Palestinian Authority's law enforcement apparatus that was supposed to crack down on terrorists. Mr Balawi was apparently in the church when he was shot, and so too were Israeli troops, even though Israeli army spokesmen have repeatedly insisted that their troops would respect the sanctity of Christian holy places. The Syrian Orthodox Church building in Bethlehem has been at the center of the heavy fighting in the city where Jesus of Nazareth was born over 2000 years ago. At the same time a moaning Palestinian man was brought to King Hussein hospital dripping blood from his stretcher as he was rushed inside. Israeli troops made the ambulance wait for two hours after the man, shot through the armpit, was picked up at the Syrian Orthodox Church just 50 metres from the Church of the Nativity. The Church of the Nativity is shared by the Greek Orthodox Church, the Armenian Church and the Roman Catholic Church. The fighters were mainly in the Orthodox and Catholic parts, sleeping in the large basilica, the priest said. Bethlehem Mayor Hana Nasser said soldiers have taken over buildings overlooking the square and the church. At the Church of the Nativity - built over the traditional birthplace of Jesus - priests were forced to give refuge to Palestinian police and militiamen, who witnesses said shot their way in on Tuesday to escape Israeli fire. As of last week about 120 armed men were hiding in the church, said Marc Innaro, an Italian television journalist, who was trapped in the compound by the fighting, along with five colleagues. Ten of the gunmen were wounded, including one who was in critical condition, said the Palestinian governor of Bethlehem, Mohammed Madani, who was in the church. The West Bank offensive - Operation Protective Wall - seeks to halt a wave of attacks against Israelis. Much of the fighting continues behind the walls of the church on Star Street. Bullets and stones are flying everywhere. Gunshots occasionally sound elsewhere in the streets of Bethlehem. (ZNDA: Kerala) A protracted religious dispute requiring Supreme Court intervention and differences remains bitterly unresolved. The skirmish involves the Syrian Christian community in India. Last week the priests and commoners assembled at the hallowed, century-old Mar Gregorious church in Parumala in Kerala's Pathanamthitta district were overjoyed when Justice V.S. Malimath, the Supreme Court observer, declared that 88-year-old Moran Baselios Marthoma Mathews II, Catholicos of the East, had been elected the Metropolitan or the supreme head of the Malankara Orthodox Syrian Church (MOSC). However, 80 kilometers away at another historic church in Puthencruz in Ernakulam district, an equally surcharged gathering of priests and laity of the same community dubbed the Parumala meeting illegal, declared Mathews II a persona non grata and "reiterated their faith" in Ignatius Zakka I, Patriarch of the Syrian Orthodox Church based in Damascus, Syria. To reiterate their loyalty to Antioch, the 4,000 delegates attending the meeting also declared Thomas Mar Dionysius as their Catholicos. The split among the 2.5 million members of the Syrian Christian church-they are either loyal to the Kerala-based Catholicos of the East or the Damascus-based Patriarch of Antioch-now appears complete. Dismissing the rival meeting as one of "defectors", Mathews II- elected by an overwhelming majority of the 3,483 delegates at Parumala-says, "The supreme authority of the Syrian Christian Association has been unambiguously approved by the Supreme Court. The factions no longer exist and there is only one official Church." The election was held as per the Supreme Court's 1995 judgement on the dispute in the second-largest and richest church of India. The division bench had observed that the Syrian Christian Association, the parliament of the community's priests and laity, should elect the Metropolitan. There are Syrian Christian dioceses in Kerala, Chennai, Delhi, Mumbai, Kolkata and abroad in the US and UK. The Patriarchists also swear by the Supreme Court judgement and rubbish all rival claims. "According to the Supreme Court, a Catholicos or the Metropolitan can be chosen only with the concurrence of the Patriarch. Mathews II doesn't have the Patriarch's approval," says Mar Dionysius. He says the pro-Patriarch group had boycotted the election because it believed the voters' list had discrepancies. "The Catholicos group deliberately omitted hundreds of voters from our side," he says. He claimed that the Patriarch himself would soon visit Kerala to consecrate him as the real Catholicos of the East. Justice Malimath, however, rejected the charges about manipulation of the voters' list. "A tribunal with representatives from both the factions received all complaints regarding the voters' list and made the necessary corrections before the elections," he says, adding, "It is totally baseless to say that the list was fabricated." The ruling United Democratic Front Government's alleged support to the Catholicos group, which has many senior Congress leaders as its members, has also peeved the Patriarchists. "Despite our appeals the Government did not intervene to resolve the dispute about the voters' list," says a pro-Patriarch bishop. The Catholicos group also has powerful backers in the Malayala Manorama media group. The battle for supremacy between the two Orthodox Christian factions is now over a century old. Links between the Malankara church and the Eastern Church in the then Persian region date back to the 4th century, when all the churches east of Rome were brought under the authority of the Patriarch of Antioch. Until the 19th century the relationship was cordial. But in 1879 the Malankara Metropolitan openly challenged the Patriarch's rights to ordain or excommunicate bishops. This led to a division in these historic churches, which found its congregation divided on the issue of its spiritual head. The Catholicos faction says the supremacy of Antioch in the Syrian Church is confined to spiritual affairs and that the Catholicos of Kerala is the final arbiter on temporal affairs, including ownership of assets. The faction also does not accept the authority vested in the Patriarch to consecrate or excommunicate bishops. The pro-Patriarch faction, on the other hand, believes that Antioch is superior in all aspects and has the authority to ordain or excommunicate bishops. Many cases have been filed and several hundred disputes related to not just spiritual affairs but also to financial matters, like the ownership of assets like the 500-odd parish churches, hospitals, schools, colleges and so on, lie unresolved in courts. There is even an ongoing dispute over the sharing of the annual interest (about Rs 10,000) accruing from the 3,000 Star Pagodas (coins commonly used in south India in the 19th century) deposited by the Syrian Church with the East India Company. The 1995 judgement of the Supreme Court on the dispute was believed to be harbinger of peace. It held that both the Patriarch and Catholicos were independent entities, neither superior nor inferior to each other. The Patriarch, the apex court held, was the supreme head of the Universal Orthodox Church with spiritual authority over all member churches, which includes the MOSC. But it also said that the Catholicos or the Metropolitan had primacy in the MOSC's temporal affairs, including the consecration of bishops. A final verdict is expected to be delivered on April 15. The pro-Antioch faction fears that the rival group may now try to take over the disputed churches. 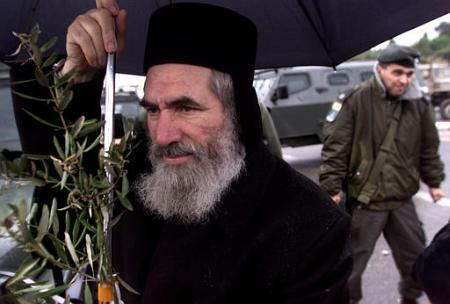 "We don't want to take over their churches but will fight to the last if they come to take over ours," says Mar Dionysius, who claims his rivals have filed over 300 cases against him, including criminal ones. A bishop adds, "Courts have no say in matters of faith. We won't allow anyone to take over our churches or assets." Having won the elections, the Catholicos group is in a celebratory mood. "Now there is only one MOSC and one Catholicos and one Malankara Metropolitan and he is Mathews II," says Thomas Mar Makarios who heads MOSC's Philadelphia-based American diocese. It's a pity though that not everybody is so assertive about the oneness in the Syrian Church. (ZNDA: Cairo) In an unprecedented court verdict, Christian actress Hala Sidqi won a 10-year court battle to divorce her husband. This outcome previously was only obtained in Egypt by Muslims. She is the first Christian woman granted divorce under a law, known as Khula'a, which has made it easier for a Muslim woman in Egypt to get a divorce without her husband's consent. The law allows immediate divorce if three months of attempted reconciliation fail to bring the couple back together, or six months if the woman has children. Under Islamic law, men may divorce wives promptly, without court authority. When the new law took effect, Christian clergy said that if a Christian woman changed her denomination from that of her husband she could be granted a divorce. Sidqi changed her affiliation from Coptic Orthodoxy, the church of her husband, to the Syrian Orthodox Church. Egyptian Christians are mostly Coptic Orthodox, and that church does not allow divorce except in extreme cases such as adultery. Pope Shenouda III, the Coptic leader, recently approved of believers separating if reconciliation is impossible, but not their right to remarry. Christians comprise about 10 percent of Egypt's population of 67 million. (ZNDA: San Francisco) Two Northern California men were indicted on 7 March on charges of orchestrating an elaborate scheme to bilk Pacific Bell out of a half million dollars in payphone revenues. A federal jury returned a 17-count indictment against Berkeley residents Daniel David, 36, and Scott Nisbet, 38, for charges of mail and tax fraud, conspiracy and money laundering. Two days later they were released from federal custody on separate $750,000 bonds signed by each of their prominent fathers. Mr. Daniel David is the son of Mr. Narsai David, famous Assyrian chef, restaurateur, and president of the Assyrian Aid Society of America, a charitable organization. The indictment is the result of a three-year investigation by agents of the Federal Bureau of Investigation and the Internal Revenue Service-Criminal Division. Authorities said the two men leased two dozen pay phone lines from Pacific Bell and routed the lines to a nearby empty office. From there, the two allegedly connected the lines to an autodialer and made more than a million calls to 1-800 numbers, knowing they would receive nearly 24 cents for every toll-free call made from the pay phones. The money laundering, tax and mail fraud charges stemmed from the two men's attempts to mask their identities and cash checks from the long-distance carriers, the indictment alleges. Authorities said they were alerted to suspicious activity after David reported roughly $440,000 from the scheme as income on his tax returns. David later claimed that he had not been paid most of the money, and deducted that amount as a bad debt expense, the indictment alleges. If convicted, both men could face up to 30 years in prison and nearly $1 million in fines. (ZNDA: Los Angeles) On 19 March members of the Assyrian American Association of Southern California voted overwhelmingly to continue funding their association's weekly television show. Called "a stunning victory" by one member, the weekly show is now expected to expand to new areas in Southern California. "On behalf of my family and myself and all City of San Jose Assyrian employees, I would like to take this opportunity to wish Zinda staff and their families, a very happy, healthy and prosperous New Year. May God Bless you and enrich you furthermore with wisdom, decency, accuracy, in reporting and serving our people and nation." "In recent years it has become a tradition during the KHA B'NEESAN celebrations in our homeland that groups of people from all over the world visit the homeland to witness the birth of new life and to celebrate the new year festivities among our people in Bet Nahrain. Also among the official guests and ordinary people, there have been special invitations to our beloved singers, for whom our people in the homeland are thirsty to hear and to see live after a long time of waiting. All this helps to rejuvenate the nationalistic flame as our national and folkloric Assyrian songs are performed. They are not interested in hearing our singers perform in other languages other than in Assyrian (SOURITH). It is a shame to hear that Assyrian performers from the western world have been invited to take part in the KHA B'NEESAN festivities and to the request of a few individuals (if there are any) songs are performed in other languages. This kind of gesture from our singers leaves greater scars in the mind of many Assyrians, who struggle daily to revive our beloved SOURITH in schools and homes and villages - what they consider a national duty. They like to see where the Assyrian Song has reached, and how a good performer can leave an everlasting effect on our young generation of singers in the home land. This can have a negative impact and it could be disappointing when they see our singers, coming from the west, and singing in other languages other than in ASSYRIAN (in Arabic, Kurdish...etc). After all, it is serving other cultures at times when all our efforts should be directed in serving ours only. I would like to note here, that I am not against listening to songs other than Assyrians, but I am opposing our performers promoting what is not to our benefit especially in the homeland where many are struggling daily to promote our language through teaching and preaching. I hope this matter is considered highly important and corrections are made before we see our young generation producing songs (in following the foot steps of our well known singers) in other languages other than Assyrian because that is where the market is, as it is heard over and over and over without considering their important role in the survival of our language and ultimately our nation. Hope to hear more from our people to spring up hope for our new generations." "Thank you for your "Happy Kha B'Nissan" best wishes (dated March 20th). Let me humbly notify you that the date when day and night have exactly the same length is not in itself the first of Nissan. 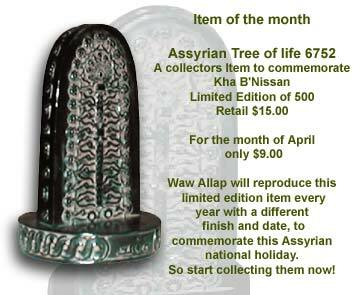 Each month beginning with the NEW MOON, this year Kha B'Nissan occurred on Thursday March 14th ! Your best wishes are almost one week late...There is more than meets the eye in this matter. Indeed the keeping of the ancient Semitic calendar is vital for anybody wishing to worship the way Jesus taught his disciples (and the way our forefathers did) namely to take part in the Passover supper on the fourteenth of Nissan (and not on the 31st of March as it is celebrated this year in most christian countries). Indeed how can one spot the 14th of Nissan if he doesn't know when the first of Nissan occurs. Fortunately some have not lost track of the ancient semitic (Assyrian / Mesopotamian) calendar. WRITE LETTERS TO MR DEPUTY ASSISTANT SECRETARY! "Please encourage our readers to sent their direct letters to Ryan Crocker, deputy assistant secretary for the Near East, and David Pearce, the director of north Gulf affairs and the KDP-PUK leadership. What I suggest is to please tailor a letter so all of us can sign and sent to the names I mentioned, because as we can all see that we are asking the rentals of our land in north of IRAQ either to allow us staying or to rent from our own homeland. We are asking the intruder's permission to let us stay. If GOD has any reason for our name to stay so he should act upon. I get sick to my stomach when seeing American meeting Kurds, but our name never mentioned as the Real Indian of Mesopotamia. So what are our political leaders and churches are involved of ?" For many years Zinda has been my window to find out what is happening in the world of Assyrians. This connection has helped feel a little closer to my people and less of a stranger in a foreign land. Thank you for your dedication to your people. They do appreciate it as I do." "In this week's issue of The New Yorker magazine, dated March 25, with a picture of Oscar on the cover, there is a compelling article entitled The Great Terror. The article deals with the terror activities of Saddam Hussein's chemical attacks against the Kurds. The Assyrians are never mentioned but I wondered why if they are living with the Kurds in the no-fly zone in northern Iraq." "I just finished viewing the clip from the video "Assyrians in Northern Iraq..." Assuming that the rest is of the same caliber, this video has to rate as one of the, if not the best, contribution(s) of Zinda Magazine to Assyrians and the world. Please tell me you plan to submit a copy of this video to CNN or one of the major networks! Kudos to everyone who produced this piece!" "I am extremely proud of Zinda for adopting a new Assyrian calendar which corrects the mistakes and short comings of our current calendar. Zinda's efforts in reviving our true national heritage are admirable. I have two recommendations for the new Assyrian calendar . Firstly, use the original names for the months seven through ten, i.e. Tashrit, Arahasamn, Kislim, and Tebet instead of the current Tishrin I, Tishrin II, Kanoon I, Kanoon II. Secondly, fix the problem with the origin of the current Assyrian calendar. I think Zinda is the best authority to propose which episode in the history of our forefathers is the defining event clearly marking the establishment of the unique Assyrian/Babylonian identity in Mesopotamia which should serve as the origin of our calendar." (ZNDA: New Jersey) Beth Mardutho The Syriac Institute announced last month hat it has joined Amazon.com Associates to help further disseminate books in the field of Syriac studies through its web site www.bethmardutho.org. Amazon.com is the largest book retailer on the Internet. Every time a visitor visits www.bethmardutho.org home page, a listing of books available from Amazon.com is dynamically generated and linked to Amazon.com. Additionally, all other pages on the www.bethmardutho.org site give a selection of one book on the top-right corner, and a selection of two other books at the bottom. For each product purchased from Amazon.com through a link from www.bethmardutho.org, Beth Mardutho earns between 5% and 15% of the sale price. The proceeds will be used to help implement Beth Mardutho's eBeth Arké Project, announced last year, as well as other projects. The eBeth Arké Project aims at digitizing hundreds of books in the field of Syriac studies and making them available through the Internet in what will be the largest eLibrary in this field. The project is being led by Beth Mardutho in association with a number of prestigious university libraries including Brigham Young University, Brown University, The Catholic University of America, Duke University, Harvard's Dumbarton Oak's Library, Princeton Theological Seminary, and the Asia Pacific Theological Seminary. Direct donations towards the eBeth Arké Project are being accepted on www.bethmardutho.org (click on Gifts Online). 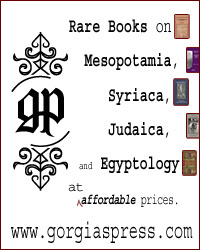 Beth Mardutho asks its patrons to use the links on www.bethmardutho.org for all their future visits to Amazon.com, even for products not related to Syriac studies. Beth Mardutho will earn money for any purchase made at Amazon.com that began with a link from Beth Mardutho's web site. (ZNDA: Nineveh) The ancient city of Assur, once the seat of a mighty empire and now an archaeological window into a key period in the history of human civilization, is on the verge of falling victim to a dam. The ruins lie in the path of a reservoir that will fill when Iraq completes the Makhoul Dam across the Tigris River some 124 miles south of the city of Mosul. The dam is designed to provide irrigation water to Iraqi farmers who rely on the Tigris, a river whose flow has been reduced by dams upstream. "The loss of a place like Assur, which was a world capital, would be a catastrophe for archaeology," says Richard Zettler, associate curator of the University of Pennsylvania's Museum of Archaeology and Anthropology in Philadelphia. "This is in the category of world- heritage sites," although it does not carry that designation officially, he says. The impending loss of Assur (also known as Ashur), and what Iraqi officials estimate to be at least 100 other ancient sites, is part of an accelerating trend in the region as countries struggling to develop their economies build dams to supply irrigation water and electricity. "This is part of a larger pattern in the Near East," says Paul Zimansky, associate professor of archaeology at Boston University. "It's not unusual for sites to be flooded. And, in some ways, these are opportunities." He notes that typically when governments undertake dam projects, it's easier for researchers to get permits and conduct field work because officials want to preserve as much of their countries' heritage as possible while meeting development goals. Beyond what the finds say about the history of Near East cultures, Dr. Zimansky adds, these sites often present young archaeologists with an opportunity for cutting-edge research they might not be able to perform if they focused on Greek or Roman civilizations, which have been exhaustively studied. Still, Zimansky says, the loss of Assur and other sites in the surrounding area will be tragic. "There's an enormous amount of information still in the ground." Although reports of Assur's watery demise first began surfacing about a year ago, researchers say, it quickly became a focus during a scientific meeting in London last month. There, officials with Iraq's Antiquities Department reportedly pleaded with their Western colleagues to help excavate ruins and record as much information as possible before the reservoir fills in 2007. Efforts to provide that help are complicated by UN sanctions against Iraq, US and British restrictions on travel to Iraq, and uncertainty over what the United States might do, given President Bush's threats against Iraqi leader Saddam Hussein's regime. Although German archaeologists began working at Assur during the early 1900s, their work was interrupted by two world wars. Work came to a grinding halt during the Iran-Iraq and Gulf wars, and only in the past few years have German, Austrian, and Japanese research teams resumed field work in the country, US researchers say. Key parts of Assur are built on a rocky outcrop that rises more than 100 feet above the Tigris's flood plain, researchers note. Some find it hard to see that part of the city threatened. But rising waters could threaten low-lying commercial and residential sections of the city - either by inundation or through the effects from a rising water table. These sections are largely unexplored and have the potential to reveal much about Assur's role as a trading center, which predates its emergence as one of ancient Assyria's capitals. "Assur is the most famous and oldest documented trade center," notes John Russell, an archaeologist at the Boston College of Art. Trying to understand the rise and structure of Assyrian manufacturing and trading from these records, researchers agree, would be like trying to understand the US computer industry's "House of Gates" from records gleaned from a local Comp USA store. "We know very little about the people of Assur," Dr. Russell says, noting that an exploration of the residential and commercial parts of the city could yield a gold mine in finds revealing more about commerce and culture. The region around Assur marks a transition zone between a wetter climate to the north and drier to the south. Some researchers hold that among the unexplored sites will be those that could yield insights into the rise of agriculture in the region. Russell, who also notes the accelerating loss of archaeological sites to dams, says he is uncertain that much can be done "in practical terms. If it's the will of the people to build a dam, a dam will be built." Countries in the region have a crying need for economic development, he adds. But beyond the well-known if not exhaustively studied sites, lie unexplored "sites that have the potential to enrich us as human beings," he says. "The good news is that I have a good harvest." "But the bad news is that you have no labourers to harvest it." "The good news is that my neighbour says I can borrow his labourers." "But the bad news is that your neighbour has already promised them to someone else." "The good news is that the other harvest is very small and won't take them long." "But the bad news is that while they are harvesting the other one, your harvest is attacked by a plague of locusts." "The good news is that the locusts are all drowned in a thunderstorm." "But the bad news was that this also flattens your harvest ..."
The joke goes on, getting ever more outlandish, until one player capitulates. Thousands of Japanese words and names of places have no real etymological meaning in Japanese - but do correspond with words in Aramaic, according to Letters from Beyond the Sambatyon: The Myth of the Ten Lost Tribes, edited by Simcha Shtull-Trauring. For instance, the Japanese daberu means "chatting" and the Hebrew daber means "speak." Gai'Jeen is the prefix for a non-Japanese person while goy means non-Jew. And kensei means constitutional government in Japanese, just as knesset means parliament in Hebrew. There are also similarities between names of kings. Osee, the first known king of Japan, ruled around 730 BCE and has been identified with the last king of Israel, Hoshea, who died around the same time - which was also approximately when the Assyrian exile took place. Some suggest the Japanese Samurai sect may be a lost tribe from Samaria. As with the Babylonian temples, the Japanese shinto temple housed a section for the holy of holies and had several gates.